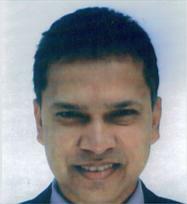 Dr. Vidurath Mayadunne qualified with a degree of MBBS in 1992 with an upper second winning a gold medal award. He had entire postgraduate training in London based hospitals and obtained the membership of the Royal College of Physician in 1997. Following this he had specialist training in Internal Medicine at Hammersmith and Charring Cross Hospital where he developed a special interest in cardiovascular diseases in the elderly. He has been in the GMC General Internal Medicine specialist register since 2002. In 2003 he was appointed as a consultant physician at Wexham park Hospital, Berkshire UK . This is a large district general hospital where he does acute general medical takes, and clinics in cardiology, general medicine, gerontology (falls and gait disorders), and lead a specialist clinic in blackouts. He has a special interest in syncope and autonomic failure and do tilt testing as part of diagnostic work up in unexplained transient loss of consciousness. His other specialty interests are cardiovascular disorders in the elderly (coronary artery disease, hypertension, heart failure, strokes/mini strokes (TIA), lipid disorders), memory impairment, confusion, and general decline in health. As part of general medical work he sees patients with weight loss, tiredness, breathlessness , chest pains, palpitations and non specific symptoms.